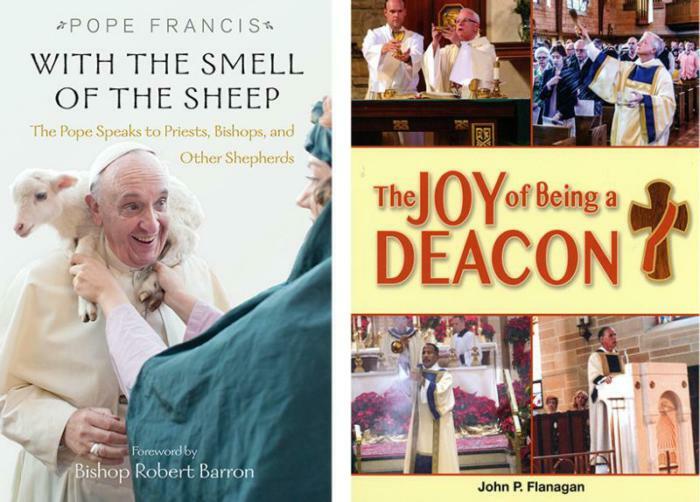 Books highlight papal advice on ministry, diaconate as 'vocation of joy'. Published 11/3/2017. Books. "With the Smell of the Sheep: The Pope Speaks to Priests, Bishops and Other Shepherds" by Pope Francis. Orbis Books (Maryknoll, New York, 2017). 297 pp., $18. "The Joy of Being a Deacon" by John P. Flanagan. Resurrection Press (Totowa, New Jersey, 2016). 128 pp., $6.95. During his first chrism Mass as pope, March 28, 2013, Pope Francis used the phrase "with the smell of the sheep" for the first time in his pontificate. As evidenced by this compilation, the pope has made it a hallmark of his ministry, emphasizing -- even when he doesn't use those specific words -- that if one is truly a shepherd in the church, then one must be among the sheep. For him, the smell accompanies the shepherd's vocation. "Smelling like sheep" is the foundation upon which the pope builds, addressing clergy and seminarians on a variety of topics, e.g., mercy, forgiveness, love, relationships and gossip, which he speaks about in several of the talks. "And allow me to use this expression: the terrorism of gossip, because one who gossips is a terrorist dropping a bomb, destroying from the outside -- not even like a kamikaze, but destroying others instead," he told the priests of Naples in 2015. "Gossip destroys and is a sign that there is no fraternity." While the pope's talks were given to specific groups in different countries, readers will quickly note his words apply to shepherds throughout the universal church. For example, in speaking to the Italian bishops' conference in 2014, he said: "Holy priests are forgiven sinners and instruments of forgiveness. They are not spiritual tourists, eternally undecided and dissatisfied, because they know they are in the hands of one who never fails in his promises and whose providence is such that nothing can separate them from that longing." There are dozens of compilations of papal talks. Most of those talks are written in an academic style -- a style that can make them difficult for those lacking the scholarly background to read, let alone understand them. Pope Francis noted that tediousness as he opened his Naples talk by stating, "I prepared a speech, but speeches are boring." Instead, he handed his official, prepared remarks to a cardinal and proceeded "to respond to a few things" specific to his audience. The pope engages readers because his style is conversational and he uses imagery they understand, e.g., "spiritual Alzheimer's" in instructing priests of Ecuador to remember from where they were called. Shepherds and future shepherds who seek to have the sheep know their voices would do well to read Pope Francis' words often as they minister among -- and strive to smell like-- those sheep. In "The Joy of Being a Deacon," Deacon John P. Flanagan, who ministers in the Diocese of Trenton, New Jersey, describes his 35 years in the diaconate as a "vocation of joy." Be it in liturgical ministry or day-to-day outreach to those he serves, he emphasizes the deacon must be joyful in all he does. His opening chapter sets the tone as he writes, "I take humor in ministry very seriously. Joy must play an important role in our ministry or we are missing out on a major part of our vocation." Be assured this is not page after page of hah-hah moments from a deacon's life. Instead, it shows how Deacon Flanagan finds joy in all facets of his ministry, and it encourages other deacons to do the same. This is an easy read, but an important one for deacons and especially for men in deacon formation. For the latter, it should be required reading in all dioceses. 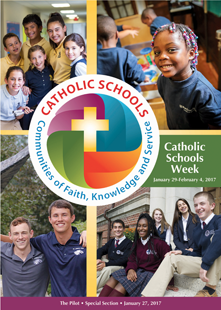 Olszewski is the editor of The Catholic Virginian, newspaper of the Diocese of Richmond, Virginia.